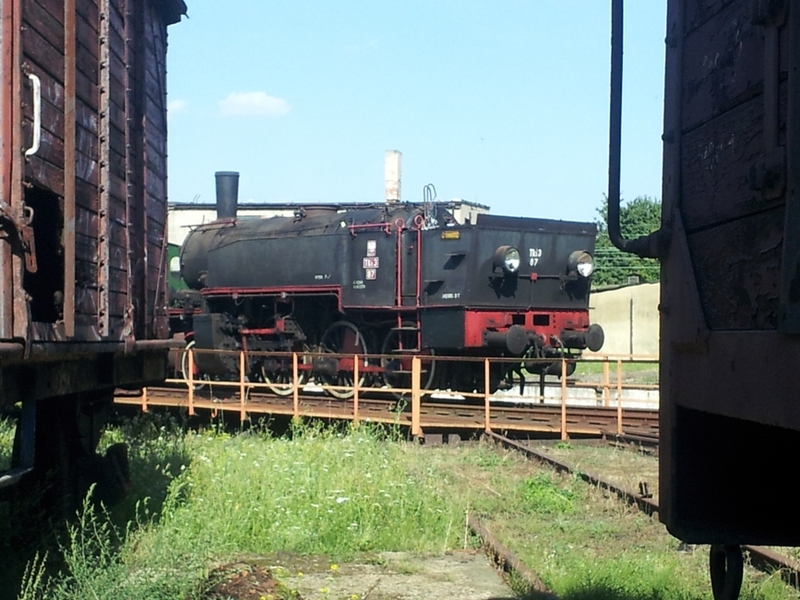 TKi3-87 on the turntable at Jarocin. Photo: John Savery. It has been a while since I wrote about what has been happening in Jarocin. Part of my lack of articles (until the recent flurry) has been down to the amount of time spent in Poland, in part on railway based activities, and in the UK, also with railway activities, with a Polish flavour. 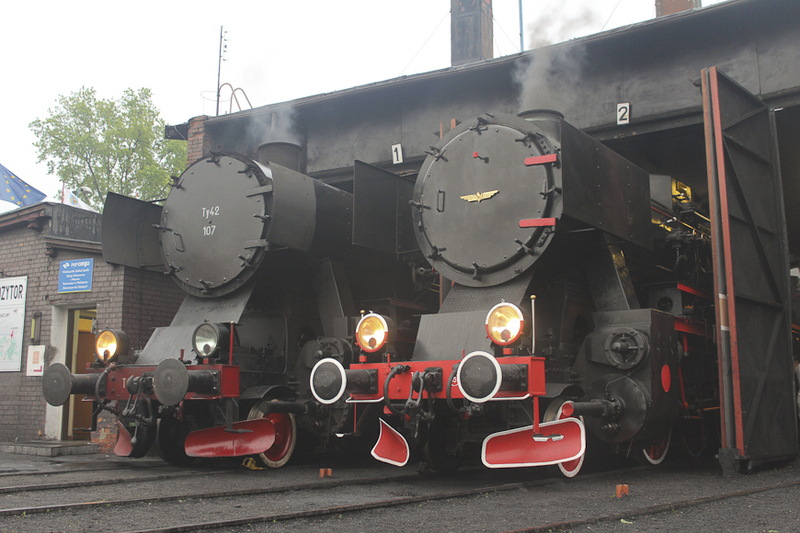 TKW, the society based at the former locomotive shed in Jarocin, have a good set up. Not all Polish societies can boast accommodation on site, with running hot water (and showers) available, and with adequate power and light in the shed. Granted, the main part is not heated, and even if it was, the cost of the fuel to heat it would be outside the society’s resources in the middle of winter. Nevertheless, the society’s facilities are well ahead of most others. 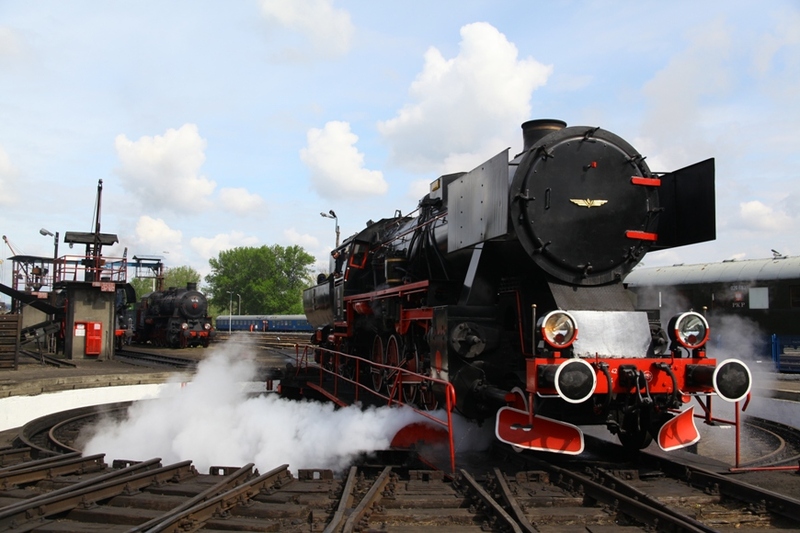 Back in 2010, the society stepped in to provide accommodation to TKi3-87, formerly based at Wolsztyn, and the property of the Poznan Model Railway Club (PKMK). The loco finished working in Wolsztyn in 2001, and was towed to Gniezno for storage. 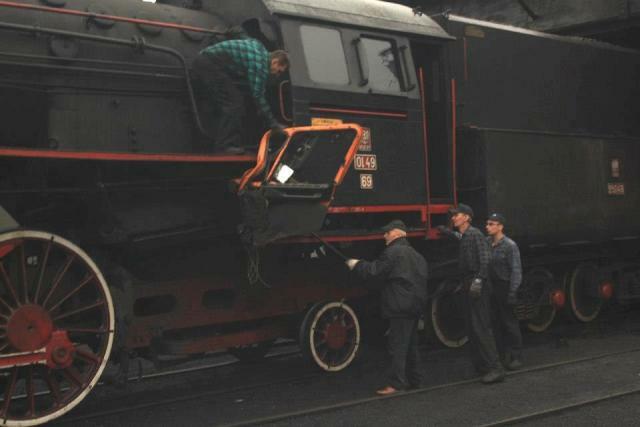 Following the closure of the Gniezno workshops, the loco was moved outside, open to the elements, and anyone who wanted to help themselves to parts of it. Fortunately, very little of the latter seems to have happened, however given the plight, TKW stepped in to offer accommodation, sponsors were found to pay for the move, and a long term loan agreement was reached with PKMK. Gradually, a group of volunteers has been formed to start to prepare the loco for overhaul, and this has resulted in a spate of activity over the summer. Whilst some parts had been removed prior to this year, regular working parties have progressed well. The external boiler fittings have been removed, as have cab fittings. This has allowed the cab to be lifted from the loco, and in turn, allowed the side tanks to be lifted. The cladding has been removed from the boiler sides to give access to the boiler shell. Additionally, the reverser mechanism has been removed to give access to the side of the firebox, and parts of the cab floor have also been lifted to give access to the mounting bolts for the reverser. For the first time in over 15 years, someone has managed to squeeze into the boiler barrel, if only to assist with removing the regulator valve rods. Removing the regulator gland. Photo: Konrad Czapracki. Much now will depend on the condition of the boiler barrel, and it is anticipated that the tubes will be removed, and boiler shell samples taken for analysis in the new year. This should give an indication of the level of work required on the boiler. The Polish regulations require samples to be cut from the plates, instead of non-destructive testing. 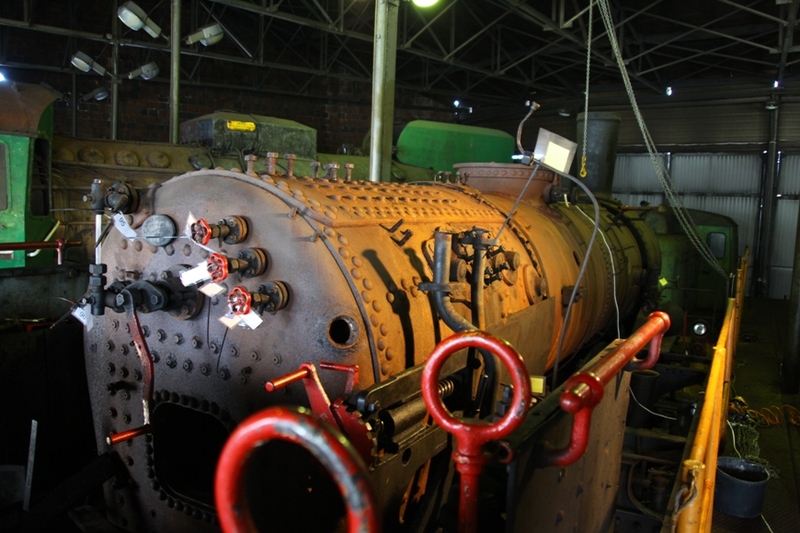 A view of the boiler without the cladding. Note the holes in the side of the shell. Samples were taken whilst at Gniezno, but never tested. Photo: John Savery. It’s fair to say that it is unlikely to be a fast track restoration, and is likely to depend on the number of volunteers continuing to grow as visible progress is made. Nevertheless, each journey begins with a single step, and hopefully the first ones in the restoration of this locomotive have now been taken. 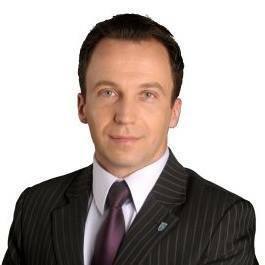 Wojciech Lis, the newly elected Mayor of Wolsztyn. The recent local elections have seen a change in leadership in Wolsztyn. The new Mayor is Wojciech Lis, known to many for his factual and regular updates on the Wolsztyn steam scene through his website parowozy.com.pl, which he has operated for well over a decade. It is clear that since the suspension of the regular scheduled service, the town has been substantially quieter. It is hoped that such an openly pro-steam mayor will vigorously push for the reinstatement of the daily steam services. Behind the Water Tower congratulates Mr Lis on his election, and wishes him well for his tenure. Tomorrow’s morning trains from Lodz to Warsaw. 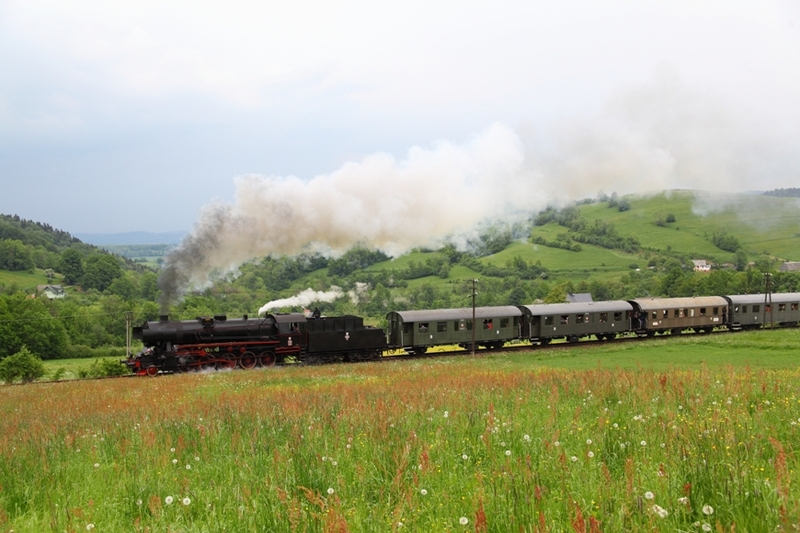 Only the Przewozy Regionalne online booking service is working. Image TK Telecom train timetable portal. 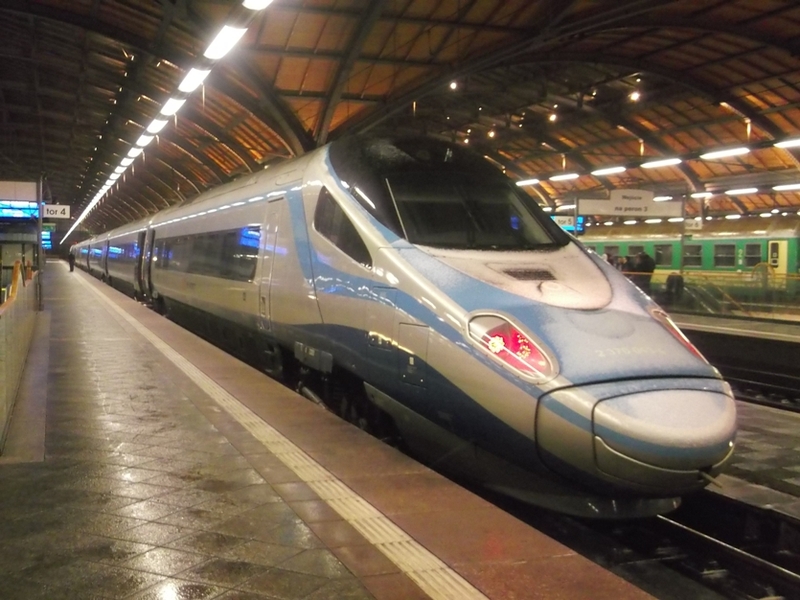 The relaunch of PKP Intercity’s ticketing system, timed to coincide with the sale of tickets for the new Pendolino service starting in December, has ended in farce. Launched on Sunday 16 November, the service quickly collapsed, and whilst booking offices at stations have been resolved, the online service, which handles Intercity’s sales is still down. Ticket machines are also affected. Together, they handle 10% of sales. No timetable is given for resolution. As of this evening, the online service remains unusable. 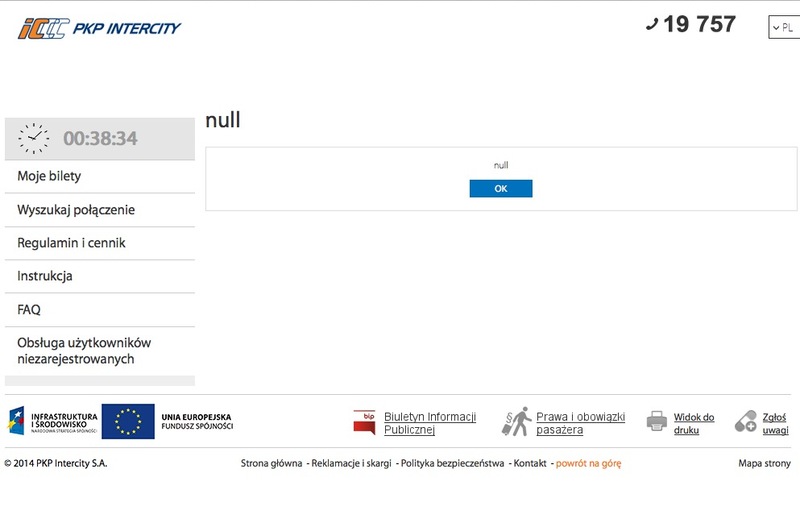 PKP IC’s own ticket portal displays a dearth of information. A crisis team has been set up, and the problem blamed on the lack of compatibility with the new system, and the existing archaic systems used throughout the PKP network. Heads have rolled. Paweł Hordyński, the board member with responsibility for IT and the new ticketing system has been removed from his post. A further two directors have also gone. Intercity have stated that the launch date for the Pendolino is unaffected. TKt48-72 in June 2012, shortly after its arrival in Jarocin. Photo Marek Ciesielski. 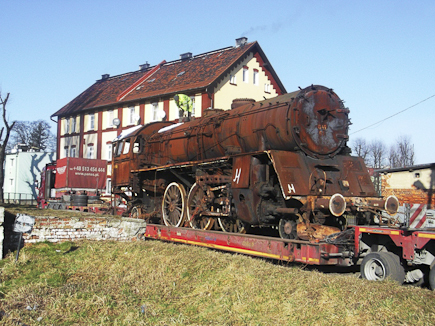 TKW, the preservation society based at the former loco depot at Jarocin, suffered at the hands of a scrap metal thief on 26 December. The thief targeted TKt48-72, which had been stored outside the shed, stripping elements of the braking system from the locomotive. By chance, a society member noticed a man behaving suspiciously, and contacted the police. The police attended promptly and arrested a 52 year old man in connection with the theft. Officers found a number of parts in the grass close to the locomotive, as well as parts laid out in some of the surrounding buildings on the site, indicating that this was not the first time that parts had been removed. The man in question is already known to the police, and, if convicted, could be sentenced with up to 5 years in jail. TKt48-72 was built in 1951 and was originally based at Bielsko Biala, and then predominantly at Jaslo. Brief interludes at Chabowka, and Nowy Sacz followed by a stint at Zielona Gora. 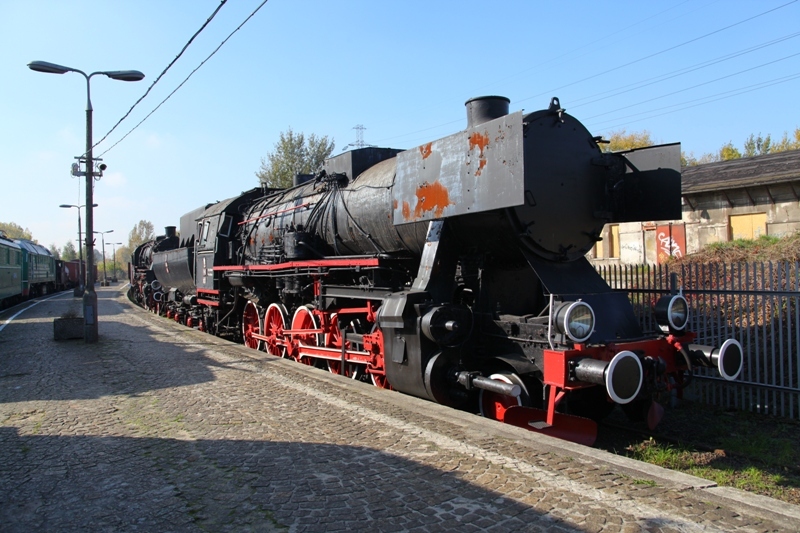 The engine spent 24 years of its life at Kepno, before being moved to Gniezno in 2000. In 1995, it was placed on the register of historic monuments, though today it is little more than a shell with many parts missing. 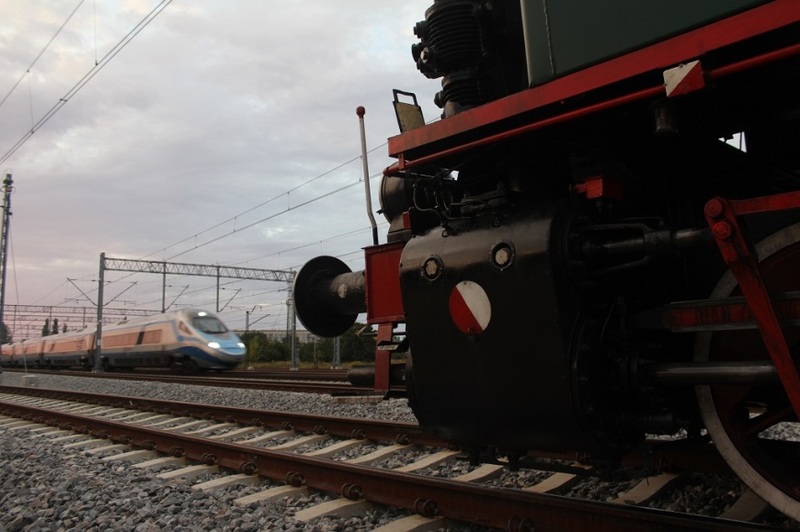 The society took the locomotive under its wing in January 2013, and at present leases the locomotive from PKP. 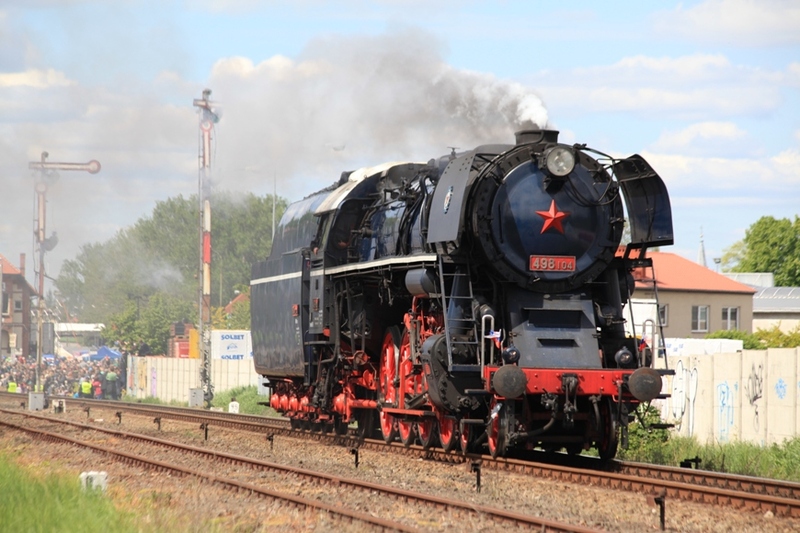 The theft highlights the risks to the remaining redundant steam locomotives in Poland. Even those in the custody of recognised societies run the risk of being stripped of easy to remove parts if they are stored outside. Whilst TKW Jarocin takes security reasonably seriously – it does have a system of CCTV cameras installed to monitor the grounds outside the shed – like other societies it is prone to people wandering through the external grounds and helping themselves to metal. 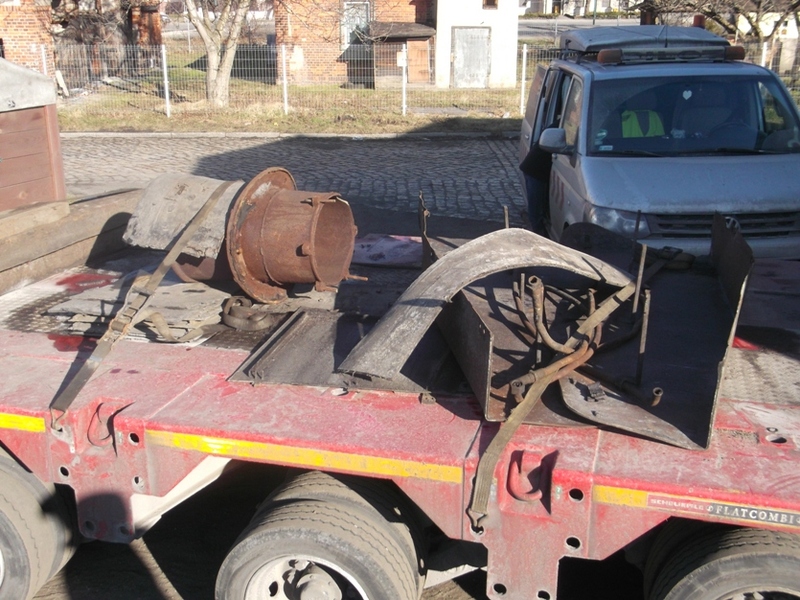 Poland would do well to learn from the UK’s recent approach to the sale of stolen scrap metal. Since the UK banned “cash in hand” scrap metal transactions, metal (and cable) thefts have plummeted. Unless a similar approach is taken in Poland, metal thefts will continue to be a serious problem. Last train to Nowy Sacz? Departing shot Ty42-107, and its train. Photo John Savery. The line from Chabowka to Nowy Sacz is on the list of lines to be closed that was published earlier this year. The scenic line, with its twisting curves and steep gradients, is worth travelling. 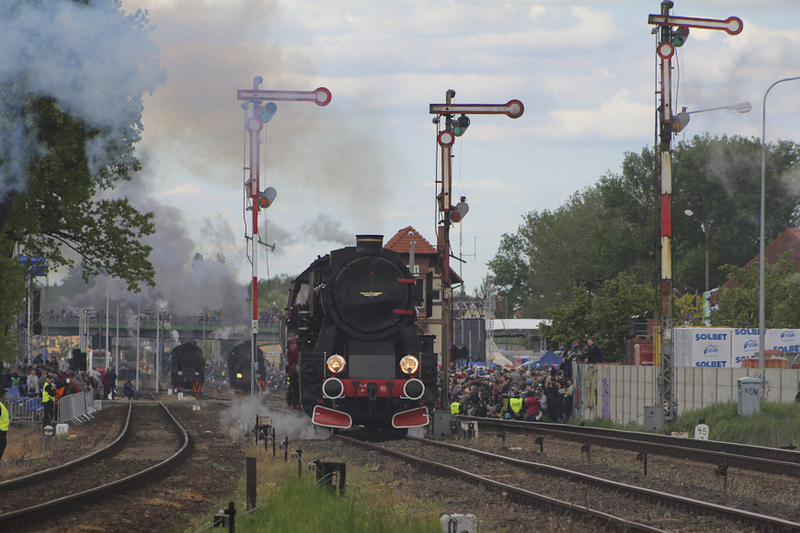 With that in mind, coupled with the fact that I hadn’t travelled further east than Dobra, forced the decision to go out for the steam hauled special on 26 May, organised by the Nowosądeckie Stowarzyszenie Miłośników Kolei (Nowy Sacz Railway Society). Tickets for the special sold out weeks before, however there were tickets left for the Chabowka to Nowy Sacz leg of the trip, which had been added as a working train, rather than an empty stock move. A bright early morning start greeted Ty42-107, and the mixed train of retro and ryflak coaches. The 5.30 departure didn’t deter people from turning out for the train. 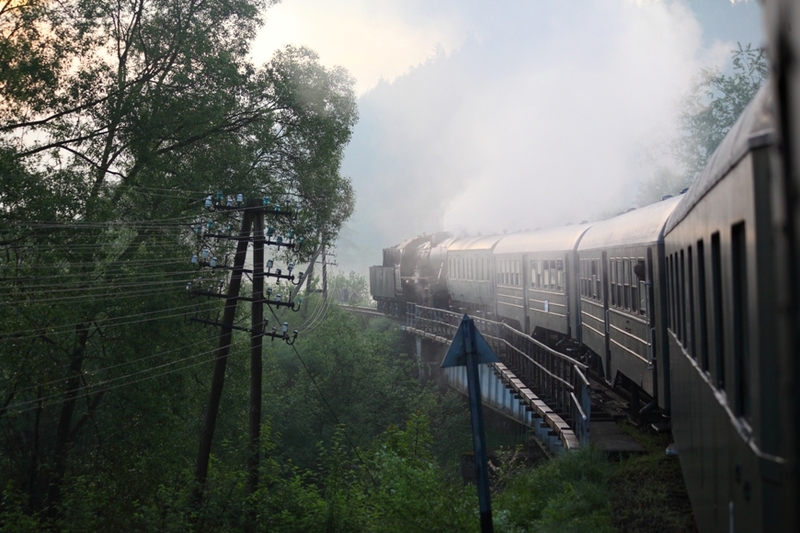 The line is rarely used, and this showed on the stiff climb from Mszana Dolna to Skrzydlna, with the loco slipping to a stand on several occasions. A wet railhead, along with a rarely used line proved a tough match for the Kriegslok, despite not having a heavy train. Pausing at some stations on the way for 5 minute breaks, the train made slow progress to Nowy Sacz, but kept time. Despite the weather, there were several groups of photographers out in force at the lineside. A large crowd greeted the train at Limanowa, many of whom boarded. At Nowy Sacz, the train was greeted by brass bands, singers, and a display of period soldiers. I was fortunate enough to be with a friend who has a wide network in the Polish gricing community, which rallies together to help each other out. Seeing a contact on the side of the line, a quick handwave, a few gestures, and a follow up text message secured 2 spaces in a car for the return trip. Special near Skrydlna. Photo John Savery. Under worsening weather, the train returned to Chabowka, full, and stopping for approximately half an hour at intermediate stations, where there were festivities laid on. With decreasing adhesion, the train stalled several times, making for a spectacular display. At one stage the crew were forced to walk ahead of the loco in pouring rain, placing ballast on the railhead so that the engine could crush it and get a grip. Special on the section Mszana to Rabka. Photo John Savery. Arriving in Chabowka, the passengers boarded waiting coaches to take them back to Nowy Sacz and the intermediate towns. As we close for press we have heard that the line has been saved from closure as it is of national strategic importance. 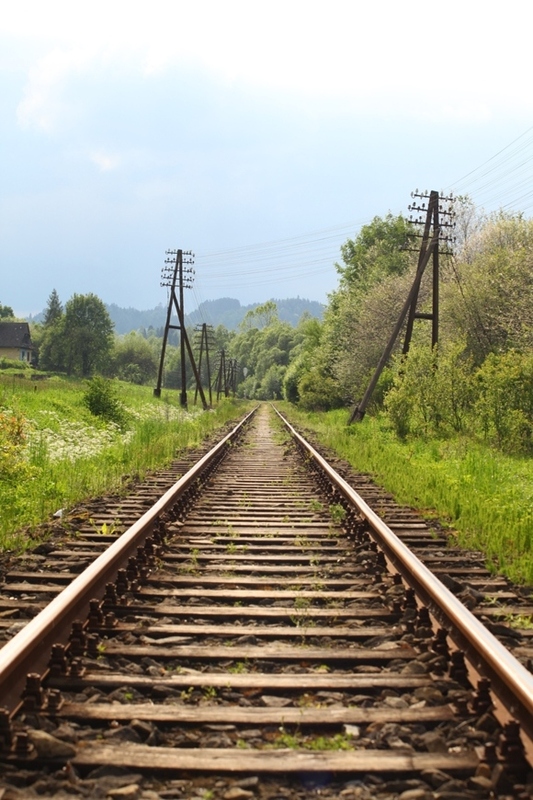 There are no further planned workings over the line – the trains scheduled for Parowozjazda are only planned to go as far as Mszana Dolna, missing the steepest sections, and in some cases the most deteriorated parts of the line. 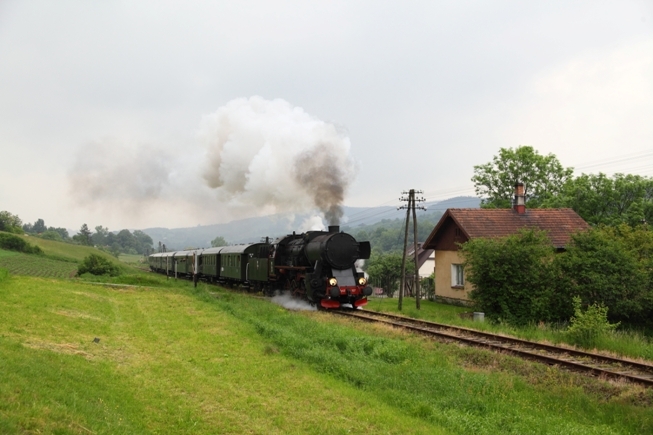 This could well be the last train to Nowy Sacz (via the Transwersalna). Only time will tell. Empty tracks near Rabka Zaryte. Photo John Savery. More photos of the trip can be seen on Flickr, and video on YouTube. 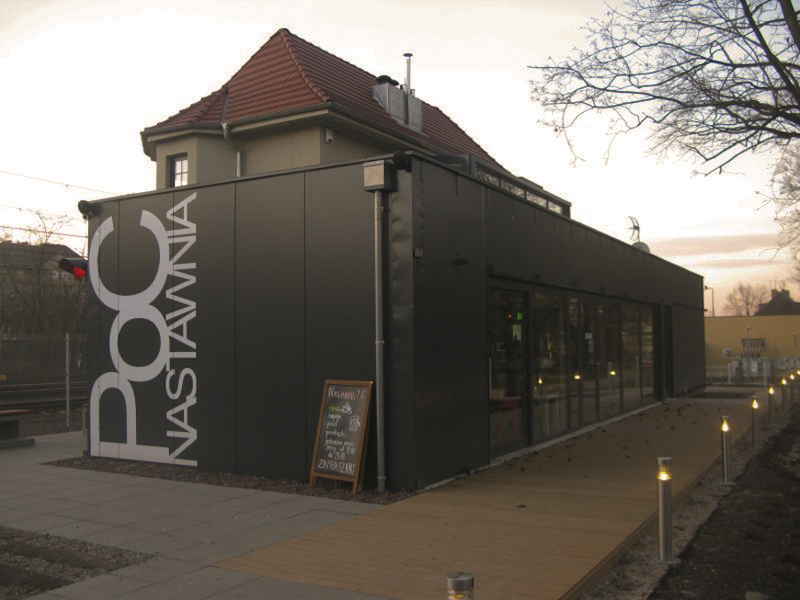 New life for old – PoC Nastwania. Photo Marek Ciesielski. It’s always pleasing to see someone find a new use for redundant railway assets. Even more so when they are restored from a derelict condition. Passing through Poznan recently, I had chance to meet friends for a drink, in PoC Nastawnia, a bar, which takes its name from, and is situated in one of the old, now redundant, signalboxes on the side of the railway. The box has been restored over a few months, and a steel framed building grafted onto the side. Whilst it not be the most aesthetically pleasing addition, it does enhance the space available on the inside. PoC is the only surviving relic of the electro-mechanical signalboxes that were around Poznan station, before the power box was commissioned a few years ago. The view – straight out onto the railway, with a clear view of the arrivals and departures from Poznan. The beer – cold and refreshing! David Tennant as Jean-Francois Mercier, 1944 built Ty2-911 as …? Publicity still. 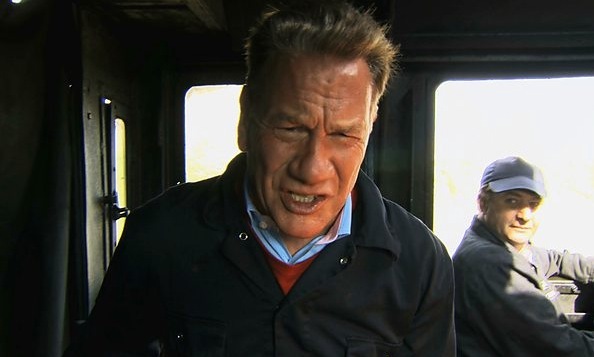 The BBC and TVP have recently aired the film “Spies of Warsaw”. Set in late 1930’s Warsaw, the film follows the exploits of a French spy, and his associates, amid the political manuvering in the build up to WWII. Starring David Tennant (of Dr Who fame), the film was made with some scenes shot in Poland. Purists will note that the railway scenes feature Chabowka’s Ty2-911, an engine not built until 1944. 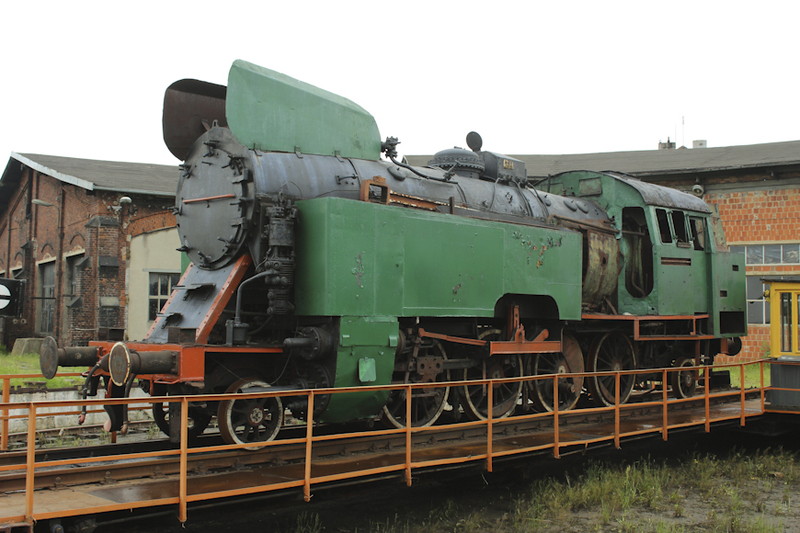 The only appearance of a historically accurate locomotive is the scene showing OKz32-2 which is under overhaul in the works at Chabowka (with Ty2-953 seen in close proximity.) Nevertheless, the railway scenes do feature some great shots of the Chabowka – Mszana Dolna – Nowy Sacz line, which formed part of the Galicyjska Kolej Transwersalna (Galician Transverse Railway). 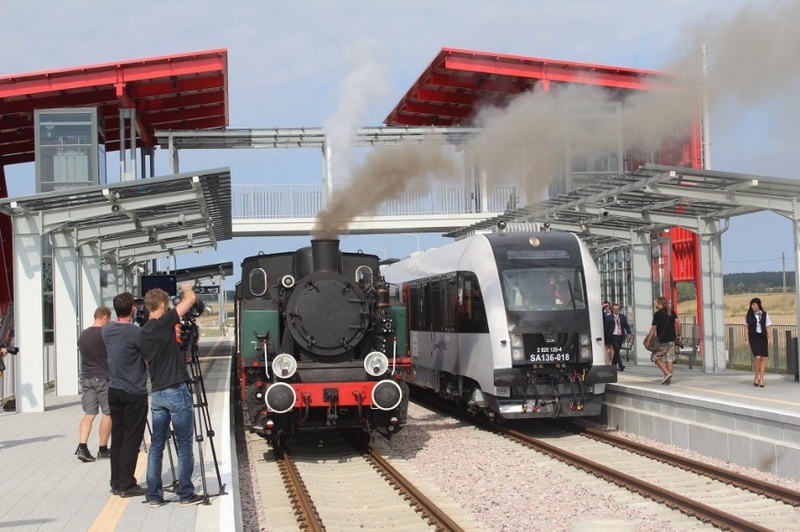 The shots also include the platform at the Chabowka skansen (look out for Ol49-44 making a guest appearance at the end of the platform), and the station at Kasina Wielka. The line itself has featured in film several times, notably in the opening scenes of Schindler’s List. With glorious mountain views, and steep gradients, its clear why film makers use the line, as well as its proximity to Chabowka. But wait, if film makers can see the benefit in the line, why can’t PKP? With minimal services over it, and minimal use of the in-ticket engines at Chabowka, you would think that it would be the ideal place for tourist trips. PKP Cargo seem unable to realise this, and for years have failed to market the line, which is closed to passenger and freight services, and clings to life by a thread. Chabowka is a wasted asset. A capable workshop and boiler facility with assets that are under utilised, and exhibits that rust outside in the Polish weather. It should be a tourist goldmine, set in some of the most beautiful scenery, on a steeply graded line. For some great photos of the line, see Michal “Doctor” Pawelczyk’s site. 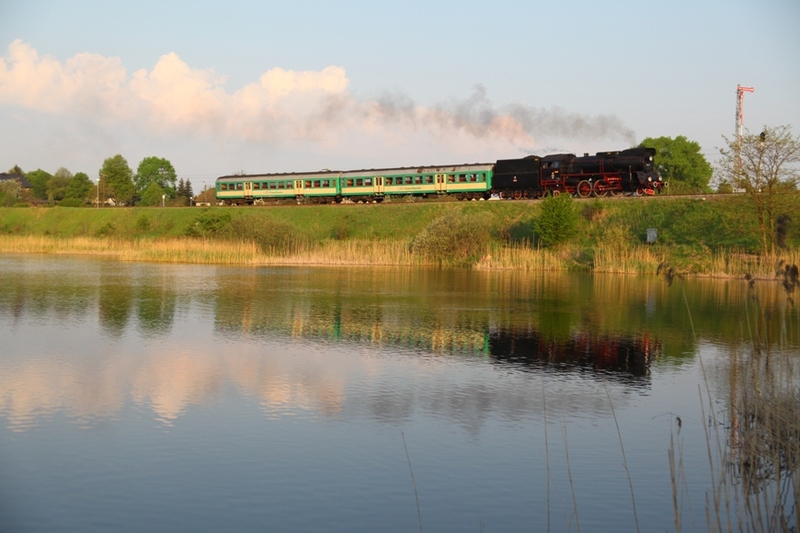 Turkol, who run both steam hauled and diesel tourist trains in Poland, have published their programme for the first part of 2013. The dates, which at present are visible to the end of August, show the usual range of long distance, and short haul charters. The programme starts on 13 February, with the diesel hauled “Wodnik”, the train to the AquaPark in Wagrowiec. The long distance Pirat (to Kolobrzeg) is set for 1 June, a marathon day out. This year’s itinery, as published so far, does contain additional trips to last year, including a trip from Poznan to Wroclaw via Ostrow Wielkopolska. Full details of the itinery can be found on the TurKol website. The crisp morning air in Warsaw tempted me with some sight seeing. I hadn’t seen much of Warsaw in the past 6 years, and with clear blue skies and bright sunlight it was a nice day to be out and about. Emerging from the early morning mist, Stalin’s ‘gift’ to Warsaw, the Palace of Culture. Photo John Savery. I had never visited the Warsaw Uprising Museum (Muzeum Powstania Warszawskiego) so it was time to pay a visit. Situated a short distance up ul. Towarowa from the Warsaw Railway Museum, the museum is easy to find and to get to. The tram stop is just nearby, taking its title from the museum. Arriving, it was clear it is popular with school visits. Purchasing a ticket from the kasa (ticket office) was easy enough, and armed with the souvenir I made my way across the courtyard to the entrance. With an attended cloakroom, I thought it would be easy enough to leave my small case (hand baggage sized) in the cloakroom, alas, this proved not to be the case and I was asked to leave it in the left luggage office opposite. Somewhat disconcerted I left the case as directed, surrounded by arriving tourists! Once in the museum proper, it was clear why it was so popular. Aside from being a fitting tribute to those that fought for Warsaw in 1944, it is informative with plenty of exhibits and that all important human touch with life stories from people caught in the conflict. With dual translations in places, it was easy to understand. My only regret is that the was a long queue for the City of Ruins cinema showings so I didn’t get chance to view the film. Walking around it was easy to become immersed in the story finishing up outside at the wall of remembrance. 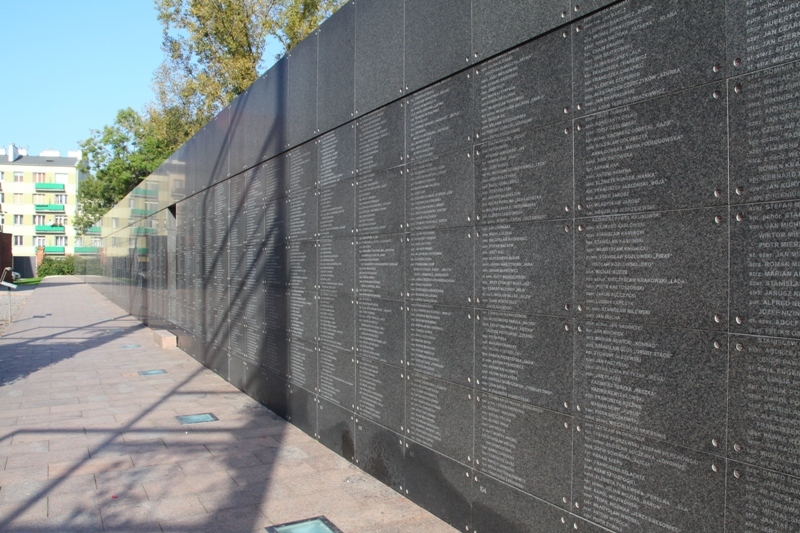 The Wall of Remembrance at the Warsaw Uprising Museum. Photo John Savery. Leaving the museum I headed back down ul. Towarowa and called in to the Railway Museum (Muzeum Kolejnictwa w Warszawie) on the way back to Warszawa Centralna station. What a contrast! Walking up to the museum, with the outside door closed it was not clear if it was open or not. On entering, there was a lady stood behind a desk and in an adjacent room a man behind what looked liked a ticket sales window (although my Polish told me it wasn’t). On asking for a ticket I was sent back to the lady in the adjacent room, who then directed me to and automatic vending machine. Inserting the correct change gave me a flimsy bit of paper more reminiscent of a parking ticket than the entrance to a museum. A complete contrast to my experience a few hours earlier. 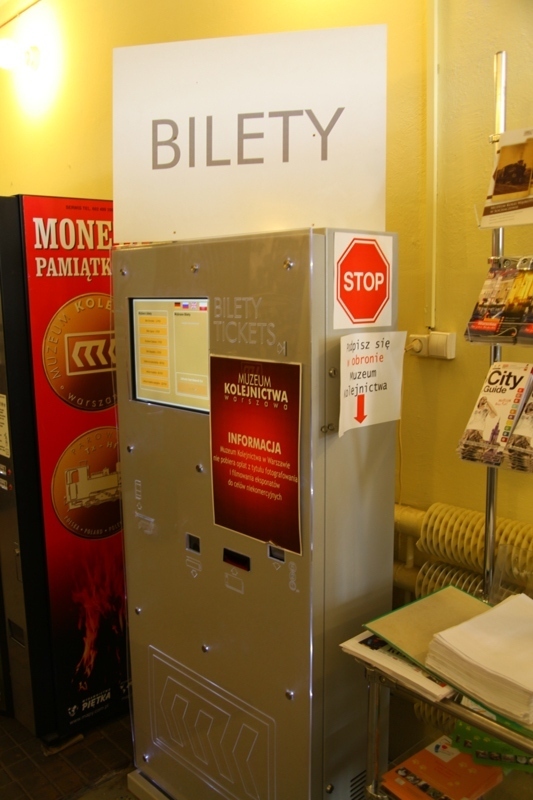 A nice and shiny ticket machine at the Warsaw Railway Museum. Photo John Savery. With the relevant piece of paper safely in my wallet I ventured inside only to be immediately stopped and asked for my ticket! It would seem that MK regard jobs for the boys (and girls) as more important than looking after its guests and exhibits. The dilapidated state of the locomotives stored outside is abysmal, and exposed to the weather they are quietly rusting away. Some renovation (painting) of exhibits is going on but it is a drop in the ocean to what is needed. Internally little seems to have changed since I last visited the museum in 2006. The internal displays are still dominated by models and there is little in the way of telling a story. The small section on the history of railways had two very familiar sections of Cuneo prints, neither of which credited the great artist. Ty42-120 on display. The outdoor storage and display of the locomotives does little to stop the weather attacking the metal and paintwork. Photo John Savery. SD80 railcar. The railcar was intact on arrival at the museum, however as it was stored outside of the museum’s compound, it was left at the mercy of vandals and thieves. Little more than a shell remains. (The bogies are out of shot of the camera.) Photo John Savery. I left the museum disappointed. Not because it did not live up to expectations. The disappointment was because the Uprising Museum proved it is possible to have an excellent museum and draw visitors in, on a weekday, in the middle of a capital city. If the Railway Museum’s management team want to run a successful museum, they could do far worse than visiting their neighbour a few hundred metres up the road. 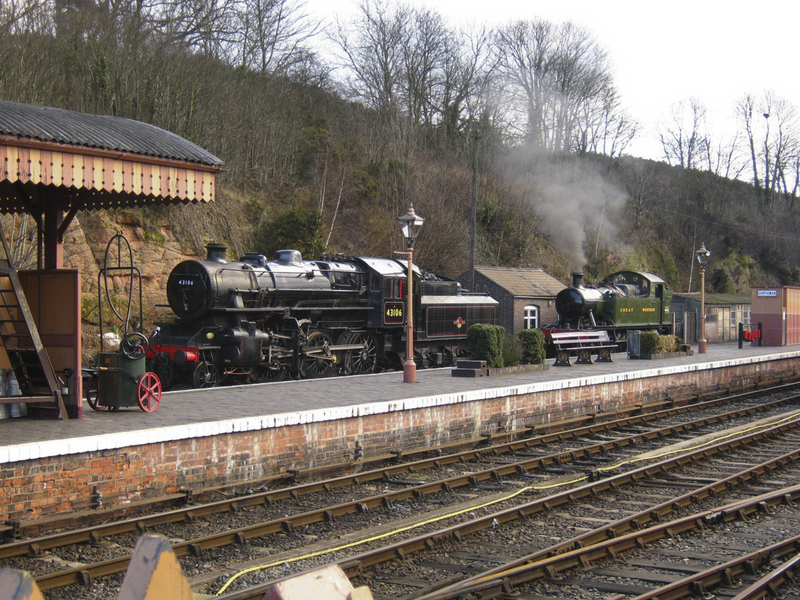 LMS Ivatt 2-6-0 43106 and GWR 2-6-2T 4566 at Bewdley, SVR, March 2010. Photo KJEvans. A last minute change of plans, and an invite from some friends who also visit Wolsztyn, gave me the opportunity to visit the Severn Valley Railway for its steam gala weekend. I’d not been to a UK gala for many years, so comparing it with the annual parade in Wolsztyn was interesting. For those not familiar with the Severn Valley Railway, the 16-mile heritage line, is one of the best established in the UK. With a connection to the national network at Kidderminster, the line meanders up the scenic valley of the River Severn to Bridgnorth, the line’s northern terminus. Following closure of the line in 1963, it was reopened by preservationists in 1970 (between Bridgnorth and Hampton Loade) and eventually extended to Kidderminster in 1984. Throughout the gala weekend, train services were scheduled continuously, including throughout the night, the clanking of buffers and the sharp bark of the exhaust easily heard from under the canvas. With visiting engines complementing the SVR’s home fleet, a good selection of motive power was on offer, with locos rostered for turns for several hours at a time before servicing. The SVR is far stricter on access to shed areas than Poland. No free run of the shed back in the UK, and certainly no wandering off up the line to get that lineside shot unless you hold a trackside permit. It is a balance. In some respects, the health and safety legislation has made it necessary to stop people wandering around the shed (I remember doing it as a 12 year old), but at the same time, it does mean that you do have a chance to see the locos without hoards of people around them, something that is impossible at Wolsztyn during the parade day. Sitting on the train on the Sunday afternoon, I had time to reflect. What can Poland learn from all this? 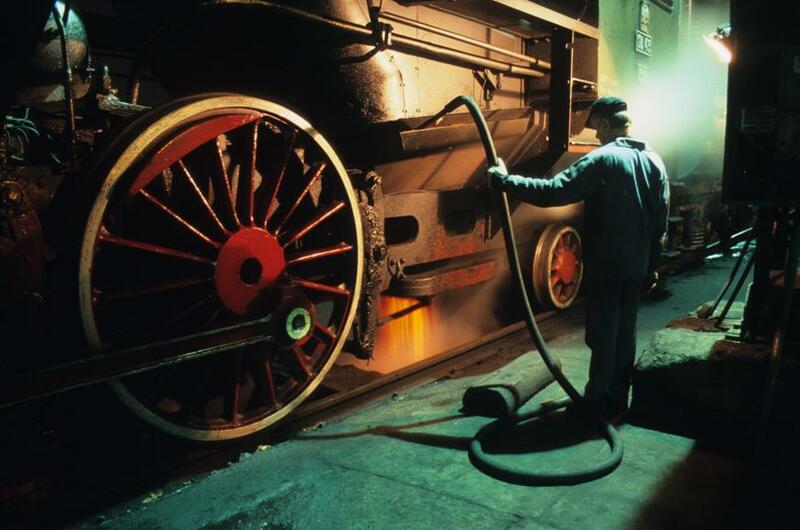 The UK has a well established steam heritage movement, and societies co-operate and support one another well. People will pay to see steam, and travel behind it, and the money is brought into the local economy. Additionally, the SVR has invested heavily in storing its locomotive collection and carriages under cover. The Engine House at Highley is a superb example of thinking big. Whilst not in the architectural style of the railway, it keeps the locos that are not currently “in ticket” protected from the elements, whilst providing an informative visitor centre complete with an income stream from refreshments and souvenirs. 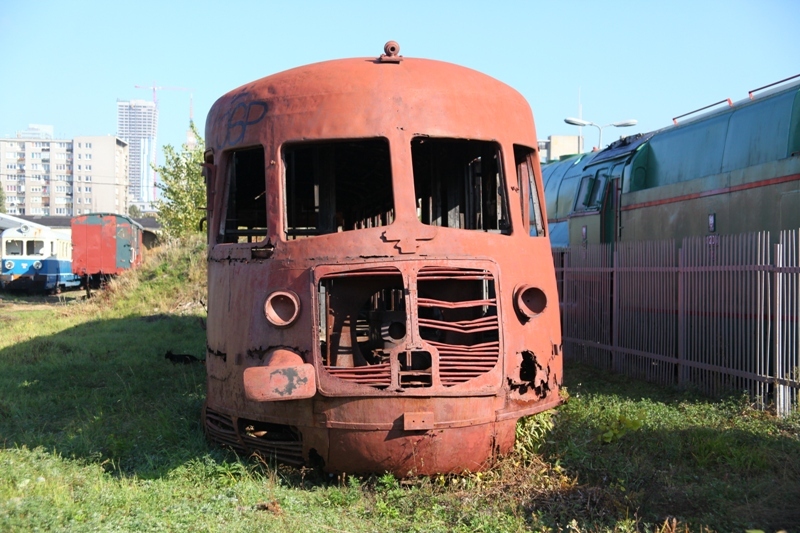 It is a stark contrast to Poland where engines stand outdoors rusting away, waiting for their next overhaul. Poland does have a grass roots preservation movement. With the right support, and the right level of leadership, it may grow to thrive. Poland’s railways are facing the same cuts that Beeching imposed 50 years ago. Will Poland’s societies take over the mantle in the same way the UK’s preservationists did? Only time will tell. 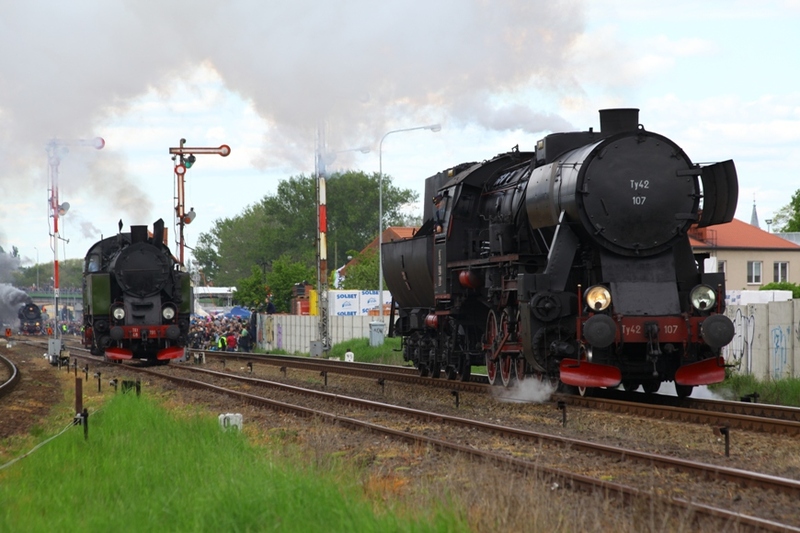 Steam services from Wolsztyn have been suspended following a collision between a lorry and Ol49-69. The collision, which took place on 11 September, caused some damage to the locomotive, including bent motion. The lorry suffered serious damage, with most of the cab destroyed. The lorry driver was lucky to escape with his life, with parts of the cab attaching themselves firmly to the locomotive. Ol49-69with the remains of the lorry’s door firmly attached to the loco’s cab. Photo James Shuttleworth. 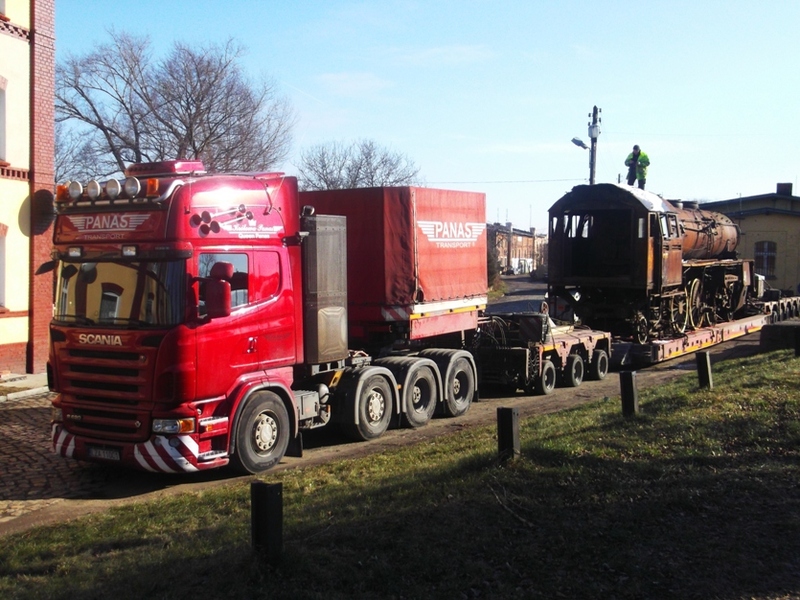 Whilst the loco was out of traffic for a couple of days whilst repairs were effected at Wolsztyn, it has since returned to service. With temperatures dropping as low as 3C at night at present, and with no other steam heated coaches available, PKP has taken the step of substituting a diesel railcar until suitable coaches are in service. It is understood that steam services will return as from today’s (Thursday 27 September) afternoon working. We understand from a senior railway source, who wishes to remain anonymous, that yesterday PKP Cargo signed an agreement for the purchase of 10 passenger coaches, suitable for steam haulage, from Czech Railways at a very good price. The second class coaches are destined for the Poznan-Wolsztyn service; the first class coaches are expected to see duty on various steam specials.